Much of December was dedicated to reimagining my apartment of 6 years and figuring out what I want out of it now. The urge to nest hit me strong and for the first time in a while I felt like filling up my minimal home. I started to thrift again, decluttered, rearranged & styled a few things, adding a lamp to my kitchen. This simple change completely changed the vibe. And it made me start cooking again. And you can do it on any budget. I’m a nut for great quality beautiful rugs. 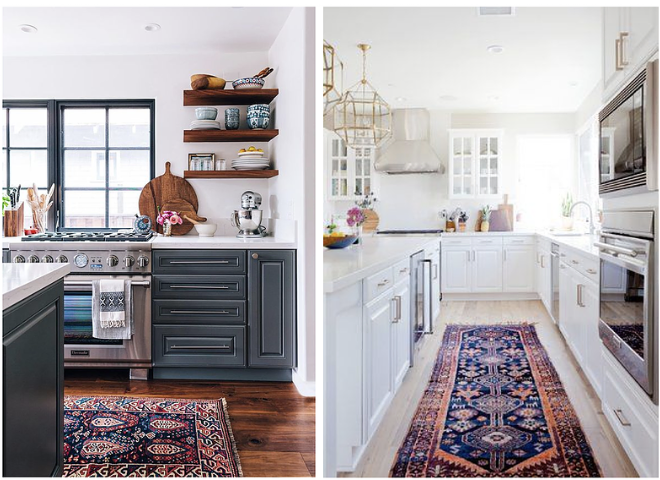 Place a traditional Persian rug in a non-traditional kitchen setting for a totally stylish and functional vibe. Just make sure it’s wool, a low to medium pile and something you seriously love. Overhead lighting is harsh and hideous most of the time. Adding a lamp to my kitchen is the biggest single improvement I’ve made. It created such a moody, welcoming vibe that Milo joined me in the kitchen and hung out with me while I made dinner a few nights last week. 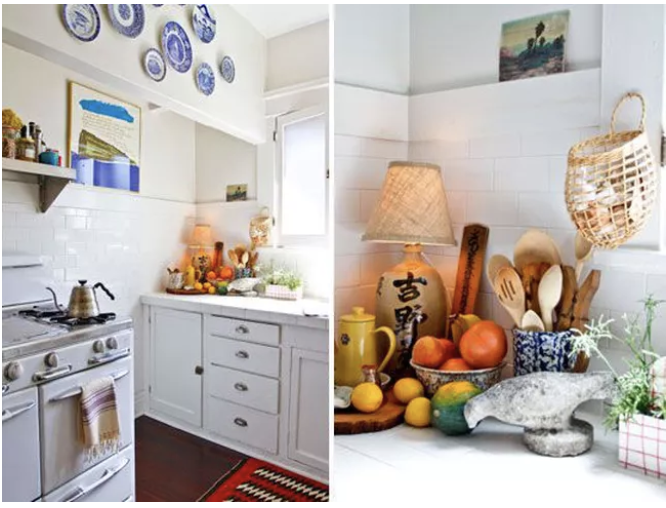 If you don’t have the golden triangle in your kitchen (the sink, oven and refrigerator – and relevant counter space are positioned in a triangle) you can create one with a super handy butcher block. It can be tiny too. Tres Chic! Growing up, two things happened every night at 6pm – my mom was cooking and the iconic opening jingle of NPR was playing on the radio (forever etched in my mind). 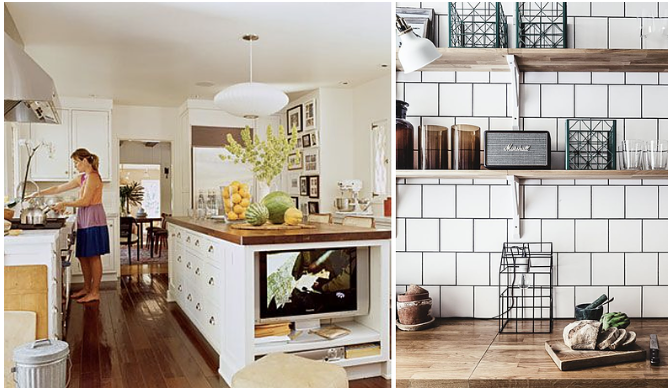 A radio or small tv in the kitchen pretty much guarantees that your kitchen will remain the heart of your home. I love to multitask so if I can catch up on a podcast or my monthly horoscope I’m much more likely to put in the time to achieve a new recipe. Creating a vibe is not just a visual thing – sounds / entertainment adds movement and keeps you connected to what’s going on in the world. I saved the best for last. 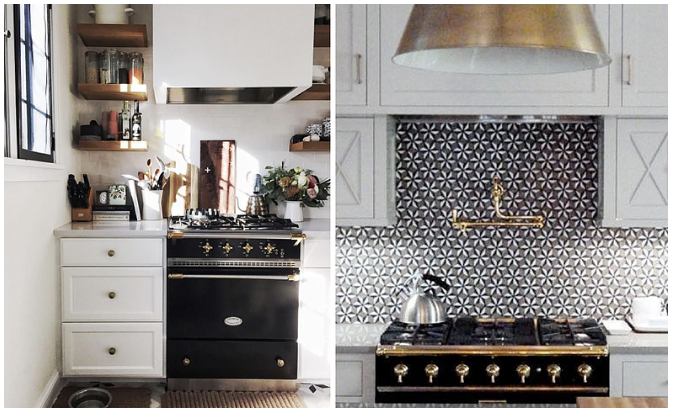 This is an old feng shui tip… if you want to double or even quadruple your money, put a mirror above your stove. It doubles your money because fire (ie. your burners) and the ability to feed yourself “mirrors” wealth – and with this tip we’re doubling it. 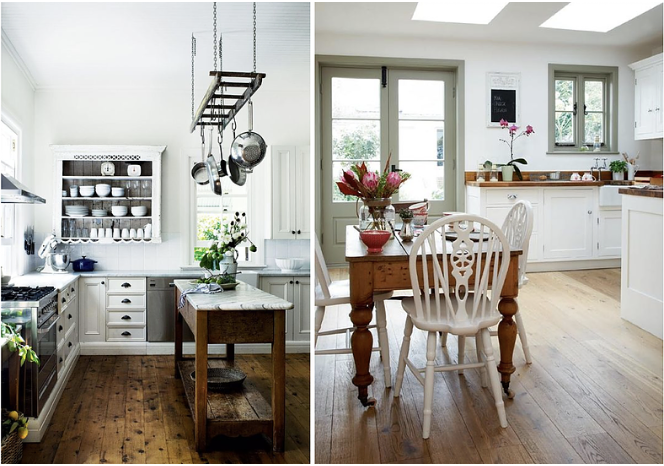 Mirrors also look extremely chic AND open up a small kitchen. They can be big or small but trust me, a mirror over the stove is a must have for any and every kitchen. Just remember to keep the mirror clean and shiny. I hope you loved these tips and I hope you’ll try them!! Like seriously, go find a lamp and try it in the kitchen. Let me know what you think in the comments below and here’s to a happy, healthy and wealthy 2018 for us all!! !